The amount of funding that ICO’s have received in 2017 and the beginning of 2018 has been staggering to say the least. Even though many early ICO investors have had a lot of luck, many investors have lost a lot of money due to exit scams or projects CEO’s spending the funded capital on restructuring their homes or new Lamborghinis. A new ICO model has to put in place to somehow regulate and decentralize the flow of money that the project owners receive. A bit more control is given to the investors as to how much capital can be used. Vitalik Buterin submitted a post at the end of January on ethresearch explaining the concept of daicos. The image below explains the new ICO concept pretty well. On the left, you have DAO which is decentralized by leveraging the wisdom of crowds. Thus, no single team is trusted and the funding can be spread over time. The right circle represents ICO’s. The combination leverages the benefits of DAO and minimizes complexity and risk. As soon as the contribution period ends, the tokens become tradeable, and the contract state changes. The most important part of what makes DAICO contracts important is the tap (units: wei /sec) counter. The counter is set to zero after the contribution ends. This parameter defines how much of the funds can be used by the development team by second. Permanently self-destructing the contract and putting the contract into withdraw mode. All the remaining Ether is proportionally returned to the respective investors. Like with most blockchain projects the goal is to decrease the amount of trust needed. This is why the DAICO approach gives investors a good amount of security and peace of mind back. In the case of a malicious 51% attack on the votes, the developer can reverse the suggestion for the tap increase. On the other hand if the project owner decides to buy Lamborghinis instead of continuing the development of the project, the voters can decide to reduce the tap amount and as a final step also vote for withdrawal and delete the contract. 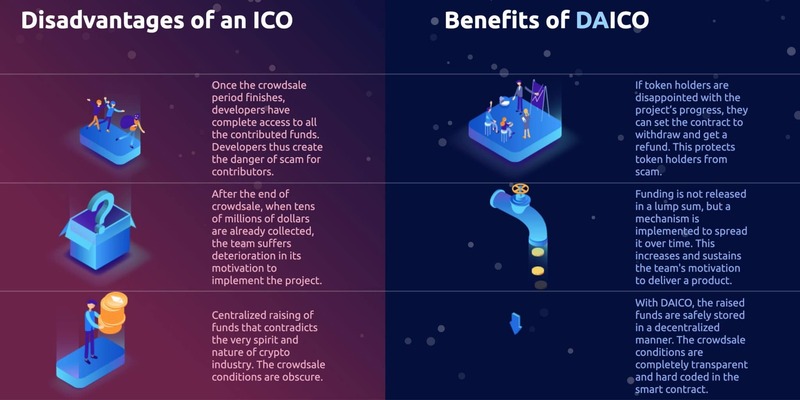 The graphic below is from the DAICO of ABYSS (ABYSS ICO using DAICO contract) and offers a good explanation of the benefits of DAICO and the disadvantages of an ICO. This is not a financial recommendation to invest in the following project. The biggest controversy around the topic of DAICO is the DAO hack which you can read about here. Immutable contracts are great when the code they are written is flawless. However, there are significant problems when a bug is noticed and no one can change the contract code. This was what happened during the infamous DAO hack at the beginning of May 2016. The security vulnerabilities that led to the hack just show how much damage can be done due to a small error in the code.